This vegan pizza might have too many toppings. Vegan options at fast food restaurants are becoming a hot item in the U.S., but the newest offerings from Domino's Down Under may drive a wedge between pizza fans. Quick service chains known for meaty eats, from Carl's Jr. to White Castle, have announced meatless options for vegan and vegetarian customers to enjoy. Not all restaurants are making the switch stateside though, like when McDonald's teased veg-heads with its McVegan ... only to test it in Finland in 2017. 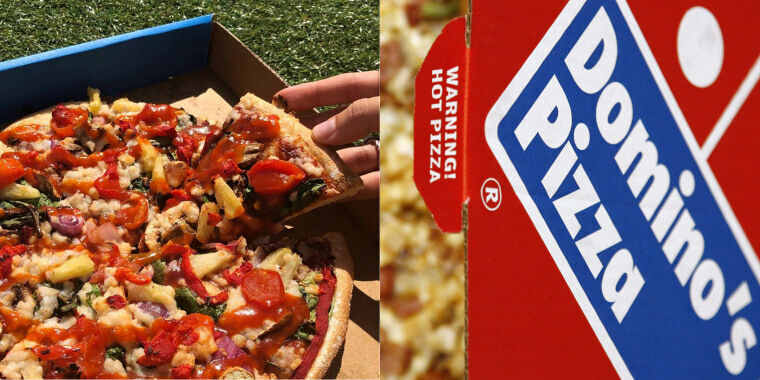 On Monday, however, Domino's launched its newest pie in 700 stories in Australia — and it's called the Vegan Summer BBQ Pizza. So, Australia already has the luxury of warm weather all year long while Americans are stuck in the cold and dreary winter, and now it gets Domino's first vegan pizza?! Don't get too upset just yet. The pizza has a barbecue sauce base with vegan mozzarella "cheese" (which is made with coconut oil and various starches), spinach, red onion, mushroom, fire roasted peppers, cherry tomatoes and ... pineapple. For those who prefer classic Italian flavors — Ina Garten and Gordon Ramsay included — pineapple is marinara's arch nemesis out to ruin pizza forever. But for others, like Dwayne "The Rock" Johnson, who sparked social media uproar after professing his love for Hawaiian pies, it's a favorite topping. So far, the the news of pineapple vegan pizza hasn't completely divided Domino's fans, and comments on its Instagram post have yet to gain team. There's been only one puking emoji — that's nothing compared to the reactions the infamous dill pickle pizza received. Most followers think it actually sounds "yummy" and would "love to try" it. One person wrote, "eating it right now, them cherry tomatoes are so gooooood." Some American fans are pretty excited about the idea, too. Hey @dominos what’s up with your U.S. vegan pizza options? Others are still totally against any type of pineapple on pizza. Pineapple on pizza is like eating pizza with a fork..... disgusting. In the U.S., Domino's has yet to announce vegan menu items but it does have recommendations for vegetarians to enjoy a few of its specialty pies like Spinach and Feta or Pacific Veggie. The question is: Will American customers add on some pineapple?